Did you know that as well as providing great value web hosting and domain name registration, simplewebhosting.co.uk are also award-winning web designers? We’d like to tell you about one project launched this month. 1979 based in nearby Stoke-on-Trent. Proprietors Joe and Julie Harrington Thorley are confident their business’s friendly, confident service can furnish customers’ every need and bring a touch of luxury and quality to every home. We had already created Joe and Julie’s Orlando villa website in 2007 (http://www.victoriavillas-florida.com) so when it came to updating their business website, simplewebhosting.co.uk was the obvious choice. The price viagra existing Victoria Carpets and Curtains website was becoming difficult to update and, more importantly, was very unattractive to the search engines such as Google and Yahoo! We were able to closely match the current design (which the customer liked), add more information, extra pages and make the whole site much more search engine friendly. 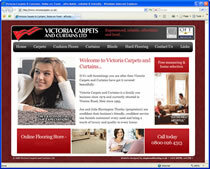 Visit www.victoriacarpets.co.uk to see the end result.